News of the discovery spreads like wildfire. Ambitious lords, zealous high priests and enterprising merchants draw their plans fervently. The docks of the cities blaze with activity, as ships are outfitted for long journeys and word goes out at every village square and tavern throughout the kingdom. The New World has been found and the rush to claim and colonize it has begun! 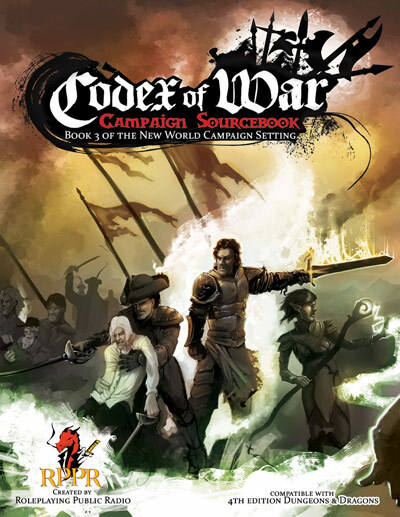 The New World Campaign Setting was developed by Ross Payton, host of RPPR for his 4E D&D campaign. It ran from December of 2008 to June 2010. Four PDF campaign source books were released via the ransom model and are now available as free downloads. The New World Primer is the first supplement of a campaign setting about a newly discovered continent, suitable for most fantasy worlds. The first expedition from the old world has just landed on the shores of the New World to start the first settlement. The name and exact location of the continent is left undescribed so you can more easily fit the New World in your campaign. A few dozen colonists, including a brave party of heroes (i.e. the player characters), band together as they try to tame the savage wilderness, make peace with the native tribes and establish the first settlement. The supplement provides all you need to get started in the New World. 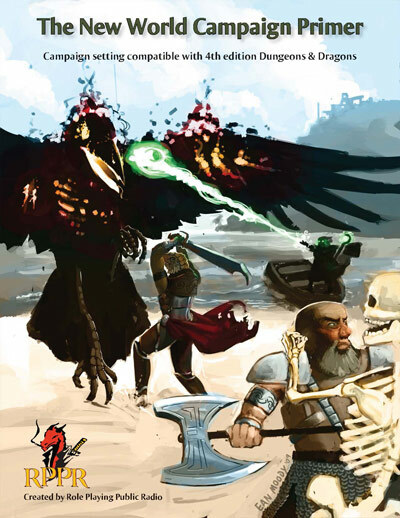 The New World Campaign Primer offers: A new player race – The grippli, optimistic frog people who want to take their place as a dominant species in the world, new Monsters – like the Raven Mocker, a necromantic scavenger and Lemurian Skeletons, wandering undead that attack the living on sight, The Lost Totem – a short adventure for level 1 characters, new feats, rituals, adventure hooks and more! Art by Josh Hunter, Ean Moody, Vincent Daniels and Alex Romero. No one welcomes the goblin horde into their land. No one wants the goblins as guests or friends. No one, not even the other monstrous races, trusts the goblins. They are as the locust, a ravenous swarm consuming or despoiling all within reach. Normally, they are held back by the armies of civilized nations but the New World lacks an organized defense. The first goblin ship has laid anchor off the shore of the New World, a massive hulk that holds together despite its improbable construction. It is a ramshackle floating fortress with countless goblins nesting within it. Its very presence destabilizes the region and if left unchecked, the goblins could overrun the New World. Art by Josh Hunter, Ean Moody, Violet Kirk and Kevin Kircus. 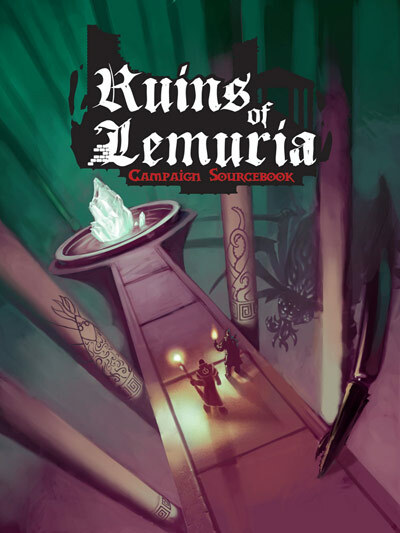 The Ruins of Lemuria describes a massive network of ruins that spread across the entire continent of the New World, the remnants of a powerful civilization more advanced in science and magic than any other in the history of the world. Fragments of their knowledge lie deep within the ruins, along with powerful magical items and vast amounts of treasure. Needless to say, if the knowledge or magic items are found and brought back to civilization, it could change the course of history. Lemurian magic and technology is still more advanced than anything else the world has ever known. A few adventurers armed with this power can end wars, curse diseases or doom their own civilization. 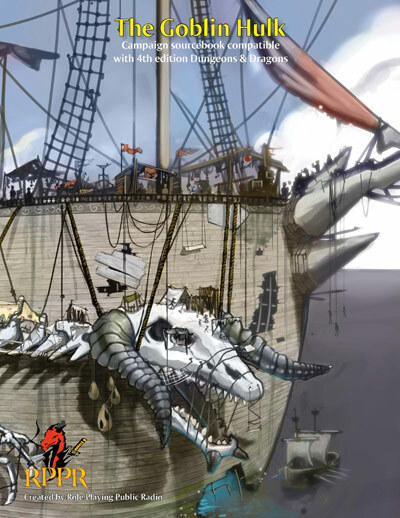 This supplement provides a framework to incorporate the Ruins into most high fantasy RPG campaigns. The New World campaign began as the RPPR 4E campaign. Unfortunately, episode 1 was lost due to technical reasons. The first recording is episode 2. It concluded with episode 46. For more great actual play podcast, check out the RPPR Actual Play Podcast. Episode 24 – A dinner party. Seriously. No combat. It’s the best session of the campaign. For reals. Episode 29 – The Ultimate fate of the gnome rogue, Bright Eyes. Episode 31 – Epic Tier begins! The revolution has begun! Episode 38- In which I rip off the movie Avatar using frost giants.